MANY of us become obsessed with pop stars or rock bands as young teenagers, but Jacob Field took his fandom to the extreme. The singer with Surrey band The One Hundred admits he changed his name to Jacoby to match that of Jacoby Shaddix, the frontman with American metal band Papa Roach. a tattoo featuring the logo from the band’s Infest album. So far, so ordinary – except Jacob’s band ended up touring with his heroes and he was forced to admit his obsession to Papa Roach themselves. “It was the most weird experience ever,” he says. “I was eight years old when I bought Infest, and then I got everyone at school to call me Jacoby so it was similar to Jacoby Shaddix. They were my favourite band without a doubt… and then 15 years later we went on tour with them! We played some huge venues with those guys. “I was so worried in case they were horrible people, but the whole band were the nicest guys ever. They didn’t even need to take any notice of us. They’ve seen it, done it, and they’re the icons of that genre. But we got on really well with them. 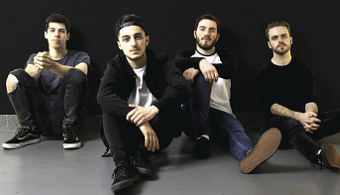 Jacob, from New Haw, and the rest of the band – drummer Joe Balchin and bass player Phil Kneller from the Woking/Guildford area, and guitarist Tom Hider from London – are now starting to make a name for themselves. The One Hundred will release their debut album this autumn – but first they will play the Reading and Leeds Festivals this month, possibly their biggest shows to date. The One Hundred play a mix of metal and hip hop and Jacob’s vocals are rap-based. He says: “There’s no reason people at Reading and Leeds won’t get into us even though we’re a bit hip-hop and dance compared with the usual acts there. As for the future, the singer says nothing could beat playing with Papa Roach…except maybe touring with Linkin Park. THE One Hundred play at the Pit stage at the Reading Festival on Saturday, August 29 and then at ButserFest at the Queen Elizabeth Country Park near Petersfield on Saturday, September 12 with Don Broco, Funeral For A Friend, Hacktivist, The Qemists and The Xcerts.